Continental Parsley, Petroselinium hortense, is also known as Flat Leaf Parsley and Italian Parsley. Continental Parsley has the same uses and cultivation as Tripled Curled Parfsley except hardier, taller with stronger flavour, but not as decorative. 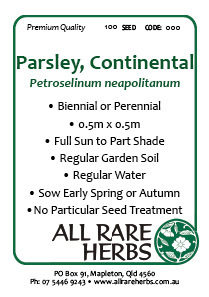 Be the first to review “Parsley, Continental seed” Click here to cancel reply.